It seems millions of others agree. Google Chrome surpassed Internet Explorer in 2012 and has only increased it’s share of users since then. The popular browser continues to grow as web developers optimize their websites for the browser most people are viewing their site with. The chart below shows an estimated browser market share. It’s important to keep in mind that more people are browsing from their mobile devices than ever before. Android (developed by Google) is the most popular mobile OS worldwide. The default browser installed on Android devices is Chrome, further padding their lead ahead of Apple’s Safari. But not everyone is happy with Chrome’s massive presence. Mozilla, the creator of Firefox, deployed a Billboard recently likening Google to Orwell’s Big Brother in 1984. Shortly after the Billboard went up, Mozilla announced Firefox 57 which promises to be a “night and day” difference to the current Firefox 55. A new design, several significant performance increases, and potentially a new logo add to the hype around the latest release. Not all browsers are created equal. Some of the underdogs don’t mind. Opera has developed an experimental browser based off of Chrome called Neon. 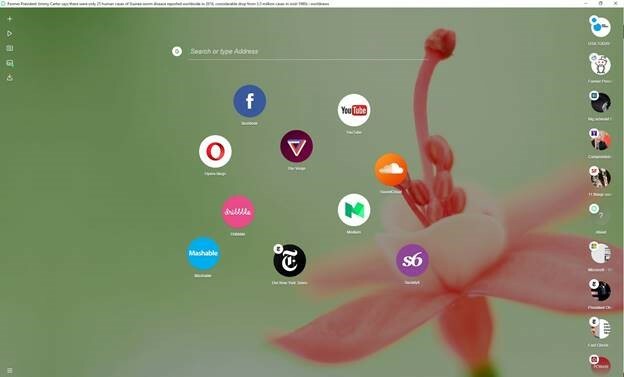 Neon uses your desktop wallpaper as it’s background and displays your most visited pages in bubbles that “float” to the top the more you use them. Though it may not matter to you which browser you use, it does matter to developers. The good news for us is that more competition in the browser market will continue to produce new features and improve overall experience across platforms. And hey, if you like Internet Explorer, keep doing your thing. Let me start by saying I’ve had my personal information compromised when large companies were hacked twice. I used my debit card to make purchases with Home Depot and with Sony shortly before they were each hacked a few years ago. Because I think internet privacy is important, and also because I don’t intend on having my identity stolen I’ve started using a few different free, secure communication services that I’ll post here in case you also plan to prevent identity theft. The first and maybe most important is an email provider called Proton Mail. All servers are hosted in Switzerland (who has much more stringent privacy laws than the US) under 1000 meters of rock. I’ll be using this account to replace my google account for everything connected to my bank accounts, Paypal, Venmo, etc. Second I would recommend installing Signal. It’s an encrypted text messaging / calling app endorsed by Edward Snowden. Third, because I don’t have a company cell phone and my cell number is connected to several accounts that should be more secure, I’ve started using Sideline. It allows me to have a second phone number on the same phone that I can give out more freely or put on a business card and not worry about it being used to access my personal information. It feels like we’ll never really have the tools to maintain 100% private online lives. Hopefully by using a few of these we can make a few hacker’s jobs more difficult.